Editor’s Note: In April, Common Ground welcomed Leah Penniman — farmer, educator, racial justice advocate — as our third annual Environmental Leader in Residence. For a week, Leah dove into the Common Ground community — observing, facilitating, leading, participating. Below, Leah shares some of her reflections on her visit. To learn more about the residency, click here. To read a Common Ground alumnus’ point of view on Leah’s residency, click here. Leah Penniman joins French students and farm staff in the garden. Photo Credit: Dishaun Harris. “We harvest the kale! We plant the lettuce seeds!” chanted the French II class at the conclusion of their hands-on vocabulary lesson on the farm. 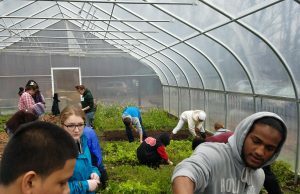 The students held themselves with ease and satisfaction as they finished their work in the high tunnel, protected from the light rain outside. They had been here many times before, knew not to step in the beds and when to circle up. No one asked for gloves to keep their hands clean, preferring instead to use the roof runoff to rinse mud from under their fingernails before heading back inside. 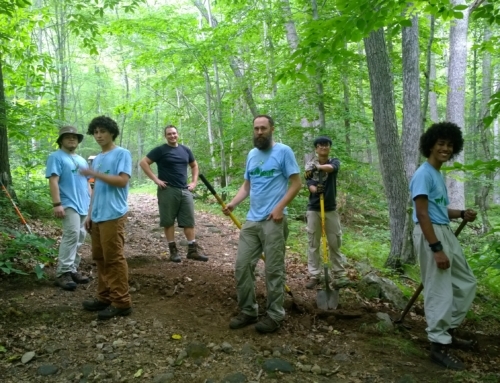 Many Common Ground students cherish their connection to the farm, its physicality and the skill mastery and purpose it offers. Others are wary, saying “it reminds me of slavery.” Some have never even touched its soil or ventured beyond the fire pit into the forest. The farm educators yearn for more meaningful connections between CG students and the farm, and are articulate about the structural changes needed to make way for the entire CG community to root and grow there. Through conversation, some powerful questions arose. What would it be like to schedule regular common planning time for the farmers and teachers to develop meaningful learning experiences? What would it be like to create a structure where every adult and young person engages in a meaningful, extended farm experience at least once during their time at CG? Some youth know how to use “environmental technologies” like caring for trees and planting a garden to heal from trauma. How could they share this with one another? Integrated into the farm curriculum, how do we address and honor land-based trauma with students of African, Latino, and Indigenous heritage whose people have been/are experiencing land-based oppression? How can we uplift the cultural foodways – culinary and agricultural – of our ancestors in order to create meaningful entry points to the farm? Beyond farming, how can we expose students to and prepare them for careers in the food system, from policy to kitchens? 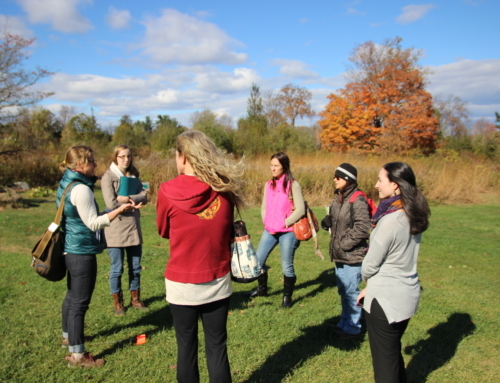 Environmental educators from across New England share fire starter stories — searching for answers to a shared question: How do we need to change as individuals, organizations, and systems to support a new, more diverse generation of EE leaders? Photo Credit: Olivia Griset. 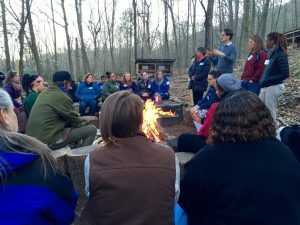 Environmental educators from across New England gathered around a campfire to tell one another what our hearts long for, where we have gone wrong, and how we convince young people that it’s a good idea to firmly lift the body of a wriggling trout from a bucket and toss it into its new wild home. Through tears, one white woman told us how grateful she was to a woman-of-color colleague who had the patience to explain systemic racism to her and help expose her blinders to white privilege. One young person shared softly that she wonders if she is “good and deserving enough” to do this earth work and was warmed to see that adults often wonder this too. It is sadly rare to find an institution that is committed to the model of a “learning organization” (Senge) consistently working toward its own transformation. From the full day “Project Based Learning for Social Justice” institute to the 2-day NEEEA conference, CG showed its earnestness in listening, growing, and being open to change. Common Ground is at an important crossroads, growing its student body, entering a new building, creating a new schedule, and evaluating its teaching and learning priorities. Through conversations, these and other questions arose. What would it be like for all teachers to have a common understanding of the “essentials” of project based learning and apply them across the curriculum? 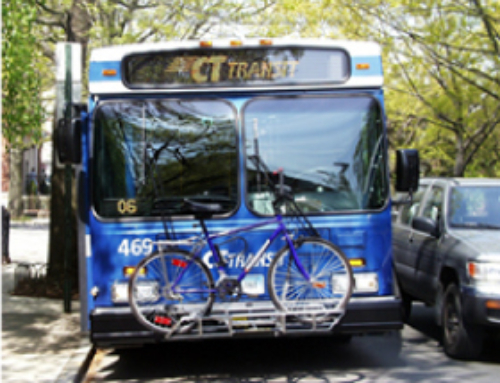 In the new schedule, how can we maintain long/flexible blocks to allow for meaningful engagement with farm, forest, city, and adults in the community? 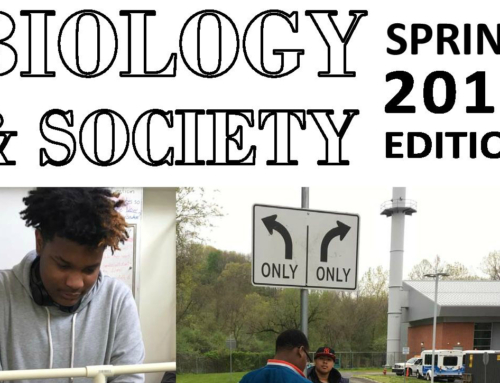 How can we develop shared expectations around the way we prioritize social justice, cultural competency, and site-based learning into our courses at CG? Which things do we need to change now? Which things can we change later? The POWER creed is powerful – what specific schoolwide tools can be used to support students in attaining these skills, e.g. team contracts for cooperation/respect? Students from New Haven high schools — gathered for a city-wide Earth Day Youth Summit — hang their hopes and commitments to action on ribbons. 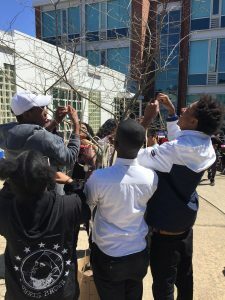 Young people from diverse New Haven high schools wrote their hopes on ribbons using colored pens and tied those ribbons to the Hope Tree in the courtyard. One ribbon read, “Stop killing us in the street. Our lives matter.” Another ribbon read, “I need to learn how to get a good job and buy back 40 acres and a mule.” Another said, “I am powerful. I can change the world.” These brilliant young people were wrapping up a day-long summit where they presented their research projects on environmental and social justice. One youth-led workshop walked participants through icebreakers, writing exercises exploring injustice in the community, and then a facilitated dialogue on actions we can take. They were poised, articulate, and informed. Young people, like all humans, yearn for spaces where they can be wholly themselves and agents in their own lives. At times CG is that space for students – like at the Youth Summit. At other times, students of color express frustration at the personal and institutional racism they experience. In small group conversations with students and staff of color, some thoughtful questions emerged as to how CG can continue to grow into a racially responsive and responsible community. How can common language and frameworks around racism and oppression be integrated into 9th and 10th grade core classes, so the whole school community gains common understanding? How can cultural studies courses, e.g. Black History, Latinx Studies, Race and Society, be made available to all CG students? What would it take to increase the racial diversity of the staff, particularly ensuring that people of color take the lead on cultural studies courses? How can we allow space, time, and resources for a POC/Black student union to meet and discuss issues of importance to them? How do we reframe the way we tell the history of environmental education to honor the leadership and contributions of people of color? What are the ways that communicate low expectations to students of color, both deliberate and unconscious? Many CG students are experts on race and justice, from their lived experience. How can we make space for them to lead and teach? I want to extend a sincere thank you to my new Common Ground family for your warm welcome, openness and trust. It was all love from the moment I arrived and Farmer Shannon was on the path to greet me, to Tagan’s special dinner at City Seed, to the last hugs from Joel, Nate, and Jesse. You all have built a special place on a sacred Rock and the future is bright. Ayibobo!